I had mentioned in my post on the 2015 garden results that I planned to discuss the soil test results that I’ve obtained and what they suggest about the possibility of further reductions in the use of soil amendments. But a sharp-eyed reader noticed I’d left it out of my post on the 2016 garden plans and let me know about it. So I went back to organize the soil test results for this blog post and in the process I learned something unexpected. Now I’ll share that with all of you and how it will affect my garden plans for 2016 and beyond. 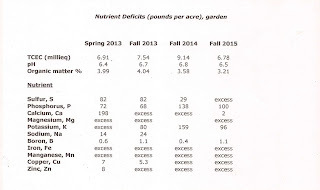 Let’s look first at the soil test results for the 15 beds in the 2013-2015 vegetable gardens and how they changed over the years. Table 1, below, shows the values for total cation exchange capacity (TCEC) in milliequivalents, the pH, and soil organic matter percentage as determined for that sample by Logan Labs. 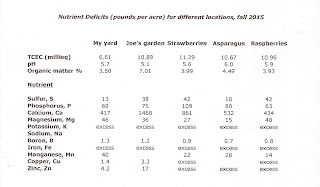 For the spring 2013 and fall 2013 testing I used the acid soil spreadsheet in Steve Solomon’s book The Intelligent Gardener to convert the results Logan Labs reported for each nutrient into pounds per acre of that nutrient. I then determined the deficit or excess for each nutrient from the instructions in Solomon’s book and report the deficit in the table below. The amendment mix is formulated to counteract the deficit in each nutrient. Nutrients in excess are so noted; the soil provides enough of these so none is added. 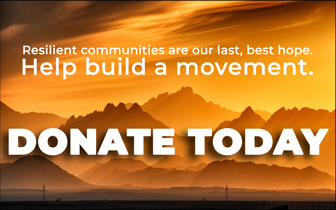 In a few cases the amount present and the amount needed are equal within error; in that case I left the space blank. For the fall 2014 and the fall 2015 testing I used Solomon’s modified acid soil spreadsheet available from this site to determine the amount of the nutrient and its deficiency or excess. First, let’s consider trends in TCEC with time and what that suggests about how the soil responds to annual vegetable gardening and re-mineralization, following Solomon’s discussion. 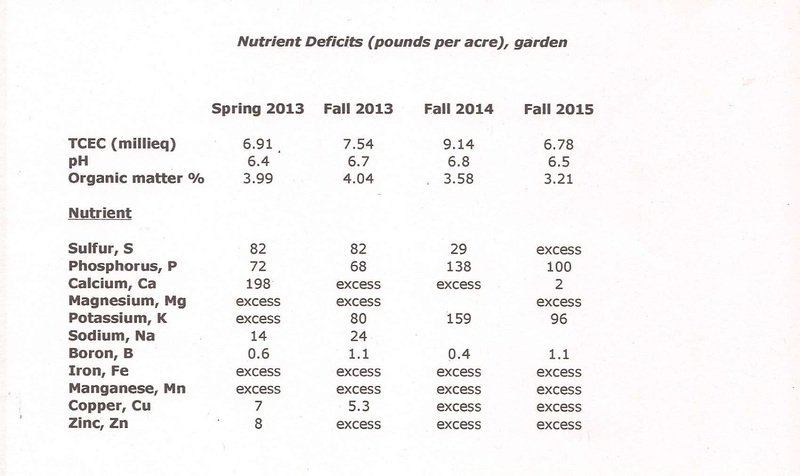 The TCEC tells us the storage capacity for cationic (positively charged) nutrients in the soil. The cationic nutrients are Ca, Mg, K, Na, Fe, Mn, Cu, and Zn. Solomon tells us that these nutrients can be stored on both the clay and the humus (fully stabilized organic matter) in the soil and likens the TCEC to a kitchen pantry. If your kitchen has a small pantry, you can’t store a lot of food, so you need to buy small amounts of food pretty often if you want to keep eating. On the other hand, if your kitchen has a large pantry, you can shop once, bring home a huge amount of food, put it in the pantry, and eat for weeks without having to go back to the store. In the case of TCEC, if it’s less than 10, the soil can’t store enough of the cationic nutrients for the entire growing season. In this case the gardener applies the full deficit or close to it at the beginning of the growing season, then adds about that much more after about two months for those crops that stay in the ground longer than that. If, on the other hand, the TCEC is 10 or more, there is enough clay and/or humus to hold onto the cationic nutrients all season long, so the gardener adds enough to erase the deficit at the beginning of the growing season and then doesn’t have to again. Looking at Table 1, we can see that the TCEC starts out around 7, jumps to 9 in fall 2014, and then falls back to about 7 again in fall 2015. Since some of the storage is humus, part of the soil organic matter, we look at that line and see that it is somewhat lower in fall 2015 versus previous years. The extended period of warm, wet weather in 2015 may have burned off more organic matter than usual. I also grew a lot more food in 2015 than any previous year, which converts some of the organic matter into food and may account for some of the reduction. Solomon suggests that 4% organic matter is a reasonable target for Missouri soils given our hot, humid summers. I don’t have that much in the vegetable beds after the last two seasons, so I will increase the amount of compost I add to each 100 square foot bed from three 5 gallon buckets to four 5 gallon buckets in 2016. My hypothesis is that all else being about the same, adding more compost might raise the organic matter percentage to closer to 4% for the fall 2016 vegetable garden soil sample. Regarding clay, I know from soil surveys that the topsoil at my location is a silt loam with little clay in it. I’d have to add clay to up the clay percentage, which should increase the TCEC and thus the size of the soil’s pantry. The soil survey says there is a layer of silty clay loam soil from 14 to 22 inches below the soil surface that doesn’t have any iron (Fe) or manganese (Mn) concretions in it. Solomon suggests “mining” for clay in the subsoil for those of us who could use more of it in the topsoil and adding the clayey subsoil into our compost piles. Since the silty clay loam layer is within reach of a post hole digger, I might give that a try this season. Some of the nutrients are found in the soil in anionic (negatively charged) forms. These are sulfur (S), phosphorus (P), and boron (B) [also nitrogen (N), but Logan Labs doesn’t test for it so it isn’t in the table]. Clay can’t hold onto these elements; only humus can. Some of the organic matter is stable humus but some of it is not that far along yet, so it isn’t an easy thing to correlate organic matter to the size of the soil’s pantry for these nutrients. If I could increase the proportion of humus in the organic matter, it should increase the size of the pantry. It so happens that something called Menefee humates is available through Fedco. I added a small amount, about a half pound to each 100 square foot bed, in 2014. That might be one reason for the increase in TCEC in the fall 2014 results, since the humates also attract the cationic nutrients and thus increase the TCEC. I don’t know why I didn’t add them in 2015, but I will add them again this year. I hypothesize that doing so will increase the TCEC in the fall 2016 vegetable garden soil sample compared to the fall 2015 sample. The pH is a measure of how acid or basic (alkaline) the soil is. Most vegetables grow best if the pH is 6 to 7, or slightly acidic to neutral (potatoes are supposed to prefer it a little more acid, however). It looks like the pH is good across time according to the results in Table 1. Now let’s look at the nutrients. The table reports how much of each nutrient should be added to reach Solomon’s ideal level for acid soil, in pounds per acre (I convert that value to pounds or ounces per 100 square feet according to directions on Solomon’s spreadsheet to formulate the amendment mix to add to each bed). If, as Solomon suggests, over time the soil begins to balance itself, the deficits should decrease for at least some of the nutrients as I continue the re-mineralization program. For S, Ca, Cu, and Zn this has proven to be the case. Mg is only slightly in excess now, compared to in spring of 2013; as I’ve noted elsewhere, this has helped with soil texture. K now needs to be added each year, but Solomon thinks it best for the garden to be slightly low in K compared to other nutrients, to maximize the amount of protein and vitamins in the crops. He no longer suggests adding Na unless there is a serious deficiency, which my soil does not have. P is a major nutrient and the soft rock phosphate I use releases it slowly, so I will probably need to keep adding this for some time. Thus, in 2016 I’m adding to the vegetable beds a mix of soft rock phosphate (for P), potassium sulfate (for K), a bit of manganese sulfate (for Mn, to bring the Fe:Mn ratio into better balance) and borax (for B). I’ll also add soybean meal (for nitrogen; when the soil critters eat it, they excrete a form of nitrogen that the plants can use), kelpmeal (for trace elements that the soil test doesn’t cover), and the Menefee humates mentioned above. So far it’s the same story as last year. But I have some new information this spring, because last fall I took soil samples from the beds planted to strawberries, asparagus, and raspberries, as well as a soil sample from a friend’s garden so he can improve his garden this year. I also take a control sample from the mowed lawn next to the vegetable beds every time I collect soil samples from my garden. 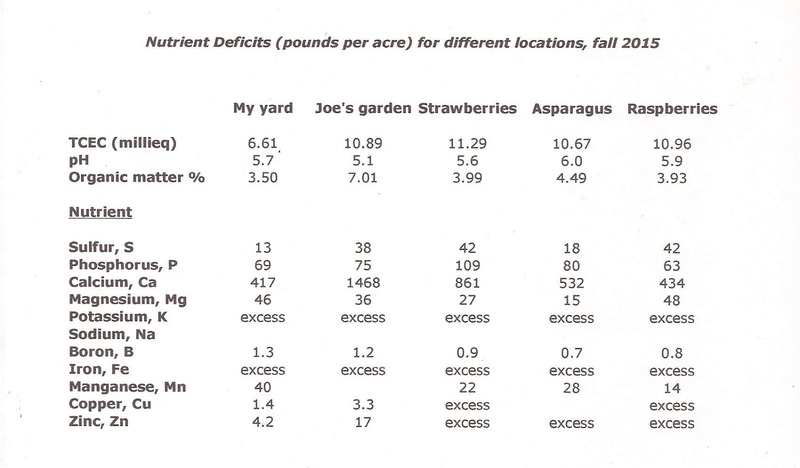 For Table 2, below, I report the results for TCEC, pH, and organic matter from Logan Labs and the deficits for each nutrient, obtained by calculation from Logan Labs’ report and using Solomon’s modified acid soil spreadsheet, for the soil samples taken from each of these areas. When I looked at the data in Table 2, what stood out was the TCEC. The soil sample from my yard had a TCEC of near 7, indicative of light soil, as did the sample from the vegetable beds nearby. The sample from Joe’s garden has a higher TCEC of about 11, which I expected because his soil has some obvious clay in it and he has a much higher organic matter percentage because he tilled leaves into his soil last year. What I didn’t expect to see was that the TCEC of my strawberry, asparagus, and raspberry beds was also about 11. And it’s not that they are in another part of the yard with different soil. These beds are next to vegetable beds, separated from them by only a one foot wide path. Remember that higher TCEC means a bigger pantry for the positively-charged nutrients. These beds have it without adding any clay to the soil. Since they have no extra clay added, the higher TCEC seems to be attributable to increased humus, which would mean the soil holds more of all the nutrients! This is what I’d like to see happen in the vegetable beds, for it would mean no need to add more amendments later in the season. Eventually, as I’ll discuss below, it may mean I can reduce the amendments I add by a considerable amount, maybe to nothing some years. So why does it happen in these beds, yet not in the vegetable beds next to them? Is there a way to make it happen in the vegetable beds? After thinking about it for awhile, I wondered if the higher TCEC has to do with the strawberries, asparagus, and raspberries all being perennial plants with good-sized root systems and with the beds containing other perennial plants as well (some deliberately planted, some weeds). While I remove the dead tops of the asparagus and the taller weeds in all the beds in spring, I leave any litter, such as autumn leaves and short dead plants, on the soil to accumulate slowly as surface organic matter, similar to what happens in undisturbed systems with perennial plants. Over the growing season, the bottom of the surface litter slowly composts into the topsoil, while roots grow, reach maturity, and die to be replaced by new roots, increasing organic matter farther down in the topsoil and perhaps the subsoil. It might be that these processes create a higher percentage of humus in the soil organic matter as well as more organic matter of any kind. Supporting that possibility, the organic matter percentage for these three beds is 4% or so, compared 3% for the vegetable garden. The lawn, on the other hand, doesn’t collect much leaf litter, nor do the short grasses and their short roots provide much in the way of plant material to decay on the surface of and within the topsoil. In the vegetable beds, I pull out the plants and weeds and compost them, most of the leaves blow off those beds and onto the beds with the standing stalks, and only a few perennial or winter annual weeds have live roots after the growing season ends. I suspect that treated this way, neither the vegetable beds nor the lawn can generate much organic matter that can decompose into humus, leading to lower TCEC and lower organic matter percentage than the beds with perennial plantings. With this information in hand, we can speculate on how to create conditions that might lead to higher organic matter levels and TCEC in the vegetable beds. Cover-cropping is a well-known way to increase organic matter levels in gardening and farming. Beds not currently being used to grow crops are sown to an appropriate cover crop for the conditions prevailing while they grow and are then cut down and incorporated into the soil before the next crop is sown. I have been collecting information on cover-cropping and have tried crimson clover and winter rye as cover crops, but instead of incorporating them into the soil I have removed and composted them. It looks like I’d do better to dig them into the soil before planting the beds to the intended crops. I do now dig in any short weeds, but this seems not to be sufficient to bring up the organic matter percentage. As I mentioned above, adding more compost to each bed might also help. The target level I used comes from places with somewhat cooler summers than mine. It might need to be increased for my conditions. The higher TCEC of the beds planted to perennial crops suggests that Solomon’s idea of moving vegetable beds to a new area each year that had been previously sown to perennial grasses, and my version of rotating vegetable beds with beds sown to a pollinator pasture of a mix of annual and perennial flowering plants, might be another way to increase the TCEC gradually over time. It won’t matter if the pollinator pastures are somewhat weedy, as long as there are enough flowering plants blooming over the course of the growing season to attract and keep pollinators in the area. I’ll manage them the same way I do the perennial crops: remove and compost the spent stalks in early spring and remove any woody seedlings throughout the year as I notice them. Since these beds will become vegetable beds again in a few years, I’ll re-mineralize them before I sow the pollinator seed mix. Each fall, I’ll take soil samples from the pollinator pasture beds, either as a unit or separately if they look different enough to warrant that, at the same time that I take the soil sample from the vegetable beds. I hypothesize that over time, the TCEC of the pollinator pasture beds will increase relative to the vegetable beds. If so, when I return these beds to vegetable production, for at least the first season they should not need a second dose of any soil amendment. Since I will be sampling the pollinator beds for nutrients every year, I will be able to see how the nutrient levels trend with time. That will let me know if it might be possible to further reduce the addition of nutrients to vegetable beds by rotating them out of production and into a pollinator pasture with lots of perennial plants for a few years. If I add some deep-rooted nutrient accumulating plants like comfrey to the pollinator pasture, that might help to bring nutrients up from the subsoil, also reducing the need to add nutrients for optimum vegetable production when the beds are returned to that use. Regarding the nutrients, I have also reported them in Table 2. Joe’s garden has a similar pattern of nutrient deficiencies to my own in spring 2013, except that calcium is even lower than it was in my garden. He’ll need to add a lot of calcium but very little magnesium this year, so he will be adding oyster-shell calcium (aragonite). The gypsum he’s adding should help to increase the calcium:magnesium ratio as well as add the sulfur he needs. Although his garden is deficit in manganese, Solomon says not to add it until the pH comes up. By next year, with this year’s dose of calcium, the pH should increase enough to add some manganese, and he should be adding less of most nutrients, maybe none of some of them. He should get the same or higher yields of better tasting vegetables this year. In the case of the strawberry, raspberry, and asparagus beds, I did not do soil testing before planting them or since then until fall 2015. While I added some nutrients the first season each bed was planted, I have not added any since, and I did not know how to balance the nutrients when I did add them. Thus I can’t draw any conclusions from the nutrient levels reported in the table. Because each bed will be planted to vegetables this year, I will re-mineralize each of those beds based on the deficiencies reported for it. I may test them separately one more year before I return to lumping them in with the rest of the vegetable beds for soil testing. As for the beds to which the strawberry and raspberry plants will be re-located, I’ll take separate soil samples from them and monitor how the nutrient levels and the yields change with time. So it looks like I have a new project to keep me busy for the next few years and to share the results with all of you. Many thanks to Chris of Fernglade Farm for reminding me that I had promised to report on the results of soil testing! If it hadn’t been for that, I would not have taken a closer look at all of the soil test results I have collected over the years, thus failing to take advantage of this opportunity to learn more about how keeping part of the garden in a pollinator pasture with lots of perennial flowers could help both the pollinators and the vegetables that later rotate into those beds. Serendipity strikes again!